While most oils come with a range of carefully formulated additives already in them, sometimes a little extra protection is required and SINTO’s range of quality oil treatment products will have your vehicles and machinery thriving. One of the most important roles your oil plays is to prevent those many metal parts from rubbing against each other; otherwise, the resulting friction can lead to overheating, degradation and costly repairs. SINTO’s antifriction oil treatment instantly coats all metal surfaces with a thin film of polarized organic compounds to reduce friction even under boundary film condition; the benefits of which include reducing friction and wear, dissipating heat, facilitating cold starts and extending the life of your equipment. Deposits can negatively impact your equipment performance by reducing fuel efficiency, increasing emissions and causing damage to those many crucial components. 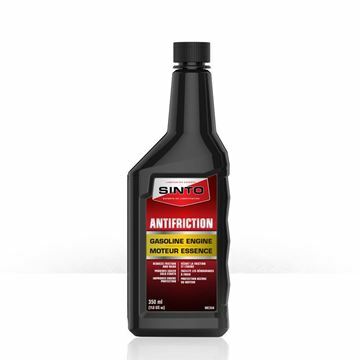 SINTO’s antifriction oil treatment products use detergents additives to protect parts against carbon and varnish build-up which is vital for parts with close clearance such as piston rings and skirts, valve lifters and oil pump relief valve. Dispersants minimize the tendency of contaminant to agglomerate into large lumps, which settle out as sludge or varnish, to keep them suspended in the oil until it is cleaned out during your next oil change. Every equipment contains seals and gaskets where the need arises to prevent the leakage of oil between the moving or stationary parts; however, seals don’t last forever and as they degenerate those important barriers can be jeopardised. For example, a rear main seal leak, can cause engine oil level to drop to dangerous levels in a matter of minutes, causing permanent engine damage. A low oil level will uncover oil pump pick up screen causing oil to stop flowing through the motor leaving the cam shaft, bearings, and valves to move without lubrication. The crank shaft will no longer splashing in the oil which helps cool and lubricate main bearings, rods and piston rings. SINTO’s seal restorer oil treatment products will restore your worn, dried, cracked or distorted seal back to its originally shape, size and flexibility sealing your leak and returning your equipment to reliable operation. The right oil additives can do wonders to improve performance and none are better than SINTO. Check out our wide range of products online and if you need professional advice, simply give us a call or contact us through our website.